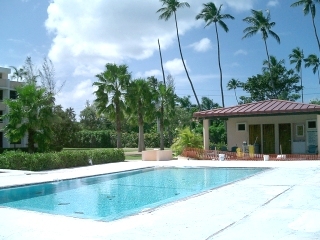 Los Almendros Condo is a convenient 2 bedroom 2 bath pool-side ground level condo in the Los Almendros Condominium Complex in Rincon, Puerto Rico . The property includes private parking, swimming pool, tennis courts, volleyball court, basketball court and playground coming soon! Price includes all furniture, appliances, air conditioning units... the works! Located off of route 429 in Corcega Beach in Rincon, the town of beautiful sunsets. Fully furnished 2bed, 2 bath condo with small den, Rattan original furniture, groun floor, close to pool, within walking distance to beach and is situated in a beautiful quiet atmosphere. This condo has A/C in living room & bedrooms, washer dryer, stainless steel Frigidaire refrigerator & oven. Excellent Investment Property. 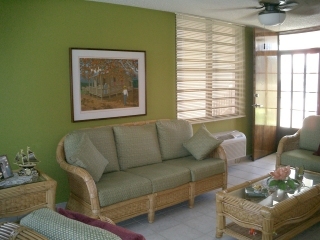 This Puerto Rico condo is located near the beautiful Corcega Beach south of Rincon. This is a golden sandy beach suitable for snorkeling, whale watching (in the winter), and other water activities. Or just sit back and relax in you own covered porch, and enjoy the beautiful sunsets each day. Press here to return to rincon Property home list..
Press here to return to our home page.